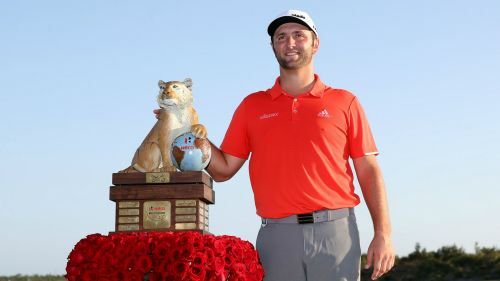 Jon Rahm claimed victory at the 2018 Hero World Challenge in style on Sunday, finishing four strokes clear. The Spaniard shot a seven-under 65 in the fourth round and pulled away from Tony Finau, who had joined Rahm and Henrik Stenson in a three-way tie going into the final day's action. Rahm went out in 32 and never looked like letting his advantage slip in a bogey-free round. Justin Rose had the opportunity to reclaim his place at the top of the worl rankings if he finished in a three-way tie for second or better but he fell short. The Englishman looked impressive late on but could only manage a third-placed finish. Rose matched Rahm by also shooting seven under in the fourth round. Stenson finished in fourth, with Patrick Cantlay in fifth alongside Rickie Fowler, but Sunday brought another 18 holes of frustration for tournament host Tiger Woods. Languishing in last place at the start of play, Woods started terribly and was four over for the day at the turn before staging a fightback. He finished in 17th after carding a one-over 73 to end at one under, and told Golf.com: "The round wasn't very good starting out. It was quite awful. "I somehow turned it around and got rolling a little bit to get to even par for the day somehow. I made a mistake there on 17, but overall it was a long week."